If you simply want to exclude the possibility that you might have Gonorrhoea or if you have previously been treated for Gonorrhoea and you want to make sure that the infection has been eradicated then this is the right test for you. If you have any symptoms of a sexually transmitted infection then we recommend one of our full STI screens in order that the cause can be correctly identified. The Gonorrhoea test only checks for Gonorrhoea: if you have another infection then this will not be picked up by this test. The current recommended treatment for Gonorrhoea involves an intramuscular injection. If this is not possible for whatever reason, we can arrange an alternative. We are prepared to treat patients who test positive for Gonorrhoea using an appropriate antibiotic if it is safe to do so. This is sent to you by overnight courier after your test results are known. We will send the kit out to you as soon as you place your order. If the order is received before 5.00pm Monday to Friday then it will be sent that day and should arrive the next morning. 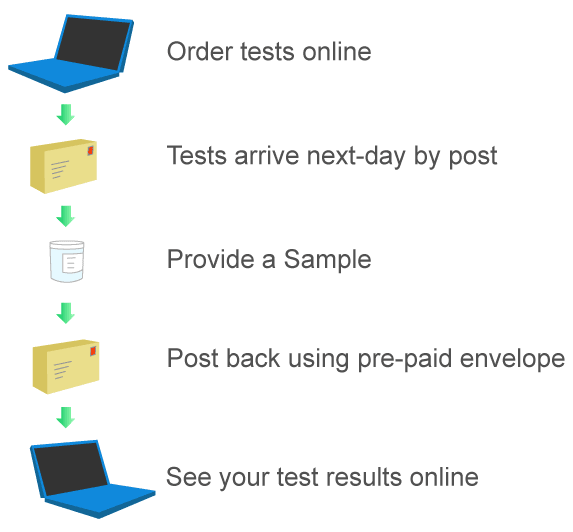 As soon as we receive your sample back at the lab it will then take no more than 24 hours for your results to be known. Your medication (should it be required) will be sent for guaranteed next day delivery. This test is laboratory-based and is the same test that you would be likely to receive if you went to see your doctor about the matter. We use TDL Pathology in London – one of the country's leading pathology labs - so you are in very safe hands! It is unlikely that any infection will show up in a test less than 1 week from the point of infection so we recommend waiting around that length of time. We have introduced a super-fast test that uses a new type of analyser. The testing method is more expensive but results are back within 4 hours, as opposed to 24 hours on our standard test. To view these new test options, please go to the fast STI tests page.